Ulstein specialises in ship design, shipbuilding, maritime solutions, power and control, and is recognised as one of the most innovative companies within the maritime market. EGGS has helped develop Ulstein's new generation automation system - designing a user experience to match the company's high performance standards. 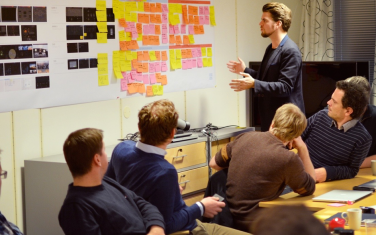 The renowned Ulstein Bridge Vision began as a collaboration between Ulstein and the Oslo School of Architecture and Design back in 2010 - after which Ulstein invited EGGS to help turn the company's ambitious concept into a reality. 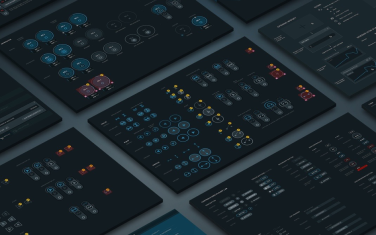 We started by rethinking the user interfaces for its marine automation solution and aimed to create a new foundation for Ulstein’s full range of maritime applications. EGGS conducted a series of workshops and user interviews that helped build an insightful and solid foundation for the design process. Ulstein’s ship design, the X-Bow, is widely acknowledged as one of the greatest hull innovations of modern times and appropriately stems from the Viking Age. The digital tools used to operate these ships reinforces Ulstein’s image as the leading innovators within their field, and further strengthens the company’s proud seafaring heritage. EGGS helped develop the solutions by combining Nordic functionalism and simplicity with the art of astronavigation. A radial histogram of alerts enables pattern recognition and helps experienced users recognise any problems. The alert star is already in operation to showcase Ulstein’s new innovative standards. Simplified alert handling: provides improved awareness and effective alert handling. 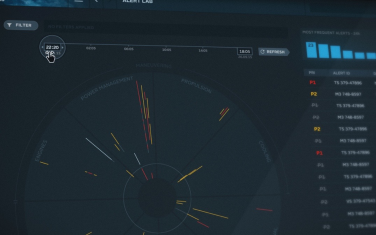 The alert star: understand complex alert situations and analyse patterns over time. The mega menu: one-click access to all content, also displaying aggregated status from all mimics. The new trend plots: provides a rich tool to monitor, compare and explore any set of values over time. The control dialog: provides simple in-context automation. The innovative GUI concepts - improving both the user experience and over-all performance of the solution. To achieve great results, a close collaboration between designers and marine technologists is required. Throughout the project, we had the good fortune to not only work alongside Ulstein’s own engineers, but also highly skilled programmers from Ulstein’s development partners The QT company. Thus, the implementation was without compromise on neither the control system back-end, nor the details of the front-end user experiences. The flexible and scalable component library and guidelines support the innovative new configuration tools. The library provides consistency and a professional finish across Ulstein’s various applications for control rooms and the ship’s bridge. Despite the maritime market reacting to the downturns within the oil industry, Ulstein’s innovative mindset allows them to adapt quickly to any new requirements that crop up. By offering solutions that are modular, easier to integrate, smarter and with market-leading user experience, Ulstein is poised to be forever at the forefront of any emerging markets.